100523 - Up, Seth home, L to Church, DG&I hanging out, Nicole & Lena over, L home, L Lena & Nicole to a wedding shower, playing games wit D&G, Jack home from camping. ALL BEFORE LUNCH!!!! Made lunch and we ate as J told us about his camping adventure. Everyone exhausted (& grumpy) so each boy got a room and a bed and rested for a bit. 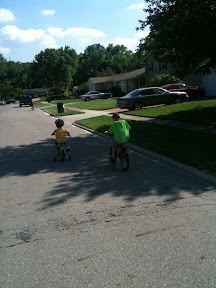 I woke J up and we rode our bikes to his friend Meridith's bday party. Home and D & I planted some lilac bushes & talked to the damn neighbor that wants to cut more trees down }:-| G up and we all rode our bikes to get J. They had a zip line the kids rode on for a bit. 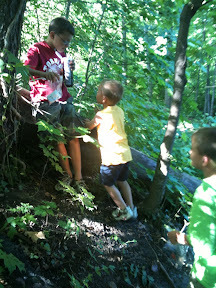 We rode our bikes home, met Up with L and headed out for some geogaching. Our first one was no longer there, but somehow J was able to did a deer laying in some brush (he has amazing eyes!). On to the second one and we found it! The third one was deep in a woods and no luck there either, but a nice walk. Grabbed some food on the way home and had dinner, then down to the basement to watch the final LOST. It was a long night, but a good ending to a GREAT series. 100516 - Jack is 7!!! !